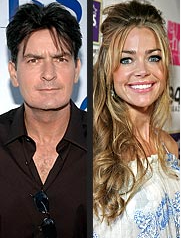 Charlie Sheen follows through with his threat to evict Denise Richards and her three daughters from their home. Denise Richards, and her daughters, Sam, 10, Lola, 8, and Eloise, 2, are on the move, RadarOnline.com has learned, since Richards’ ex, Charlie Sheen has ordered them to leave the home they have been living in — and sold it to a friend. The home, which Sheen had bought for Richards, his daughters Sam and Lola, and Richards’ adopted daughter Eloise, featured six bedrooms, nine bathrooms, and 9,000 square feet of luxury living space. Sources previously told Radar that the move will be a huge inconvenience for Richards, because her daughters go to school in close proximity to the home. “Sam and Lola’s school is currently less than a five minute drive from the house they are living in now,” a source has said. The former Two and a Half Men star has been locked in a public battle with the former Wild Things star for months, after alleging Richards wouldn’t allow him to spend time with their children during the holidays last year. Sheen had hinted on social media that he would no longer pay Richards as much child support. The Wall Street star lashed out at his on Twitter and intimated Richards would take a financial hit — vis a vis a reduction of the $55,000 a month he pays her in support — for allegedly leaving him out of the loop. no love lost between these 2 whatsoever! Didn't Denise used to be a heidi fleiss girl?? ?